Do you ever wonder what that spiny, green, spider web laced caterpillar that is crawling across your porch will be when it grows up? You should. 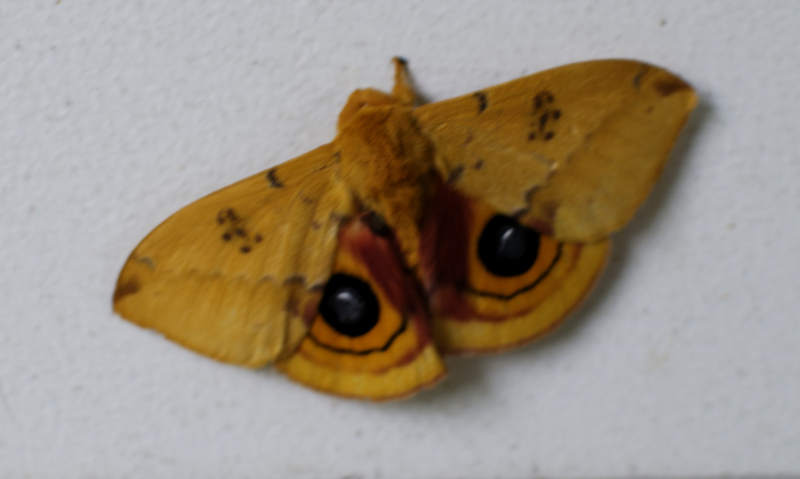 I found this IO Moth (Automeris io) on my Carolina Wren wintertime boot nest, a few weeks ago. It hung around on my porch for a couple of days, until it disappeared. These caterpillars have a sting which somewhat reminds one of sticking your hands in a nettle patch. The caterpillar pupae overwinters in the leaf litter as a papery cocoon. I am sure that most of you have seen the lovely moth; which this caterpillar turns into. Yep, you just never know what you may find; if you just look. I was sitting along Rt 66 in Pocahontas County, WV today; finishing off a slice of pizza and thought about taking a photo to submit to the Pocahontas Nature Club. I hadn't posted anything to their site in a while and hadn't taken any photos for a couple of days. I saw a Monarch laying eggs on a milkweed, but it headed across the road to the golf course. I was scanning the un-mowed field for some type of other butterfly activity and noticed what I thought was probably an Eastern-tailed Blue sitting on a goldenrod, just a few feet away from my truck. Out comes the camera and as soon as I got a little closer, I realized that this was something different. 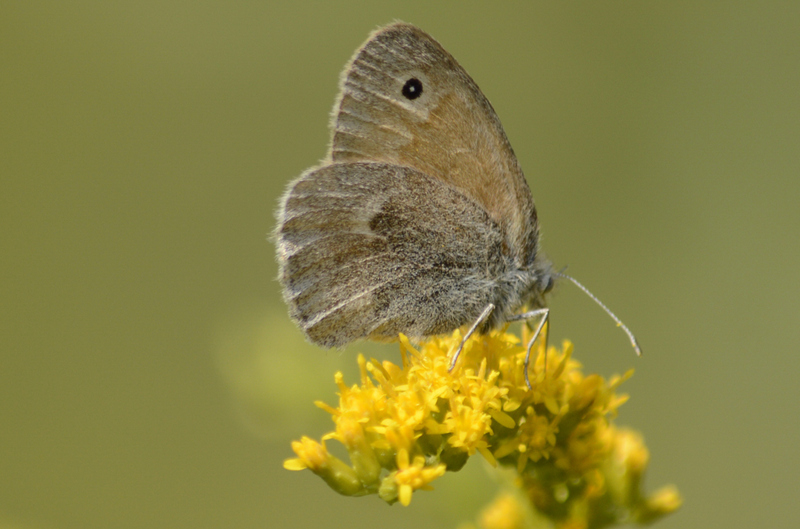 The Common Ringlet (Coenonympha tullia) is a butterfly normally found in Alaska, Canada, Northern US and the Pacific Coast. But here it is in good old Pocahontas County, WV. I know that one other was found in the Durbin area a couple of weeks ago. So, be on the lookout, ya never know what you may find. You'll never find anything, unless you look. Three things are usually to blame when our once proudly standing squash plant begin to droop, sag and just get plain yucky looking. Bacterial Wilt which is spread by squash bugs, cucumber beetles and a host of other crawling critters is very common in our area. Powdery Mildew is the white patches and splotches you see. It doesn't seem to kill the plant, unless it gets real bad. It just makes things unsightly. I think most of mine that ends up in the garden comes from some upwind phlox plants. The one thing that kills my plants is the Squash Vine Borer (Melittia cucurbitae) this strange looking moth lays eggs in the stems of young squash plants. 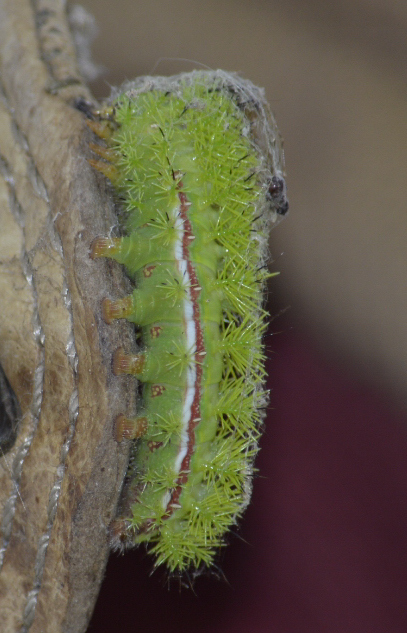 The plump cream colored caterpillar then feeds inside the hollow squash stems, sometimes quickly killing the plant. My white patty pan squash seem to be the favorite for these moths. You have to admit, though that the moth is kind of cool looking. We all expect the nasties when we pull back the shuck from our homegrown corn. Ugly caterpillars of several species can be found. The most common is the Corn Earworm (Helicoverpa zea), this caterpillar feeds upon corn, tomato, tobacco and cotton plants. The only good thing that could possibly be said of this pest; is that it turns into a moth that isn't too bad looking. I was returning home from Thomas on Saturday afternoon and decided to take the Sugarlands Road-St. George-Clover Run route back. I was intending to try for a few good mushroom photos. To say the least, mushrooms were a bit sparse on this fine day. It didn't make much difference to me; as this is always a nice ride, no matter the season. There was a group of Common Mergansers on the Cheat; fifteen in total and close to the road. A female with her brood. I had to go down the road and turn around. I was in luck, they were still there when I got back. I needed to change lenses and was crouched behind some shrubs; feeding the deer flies and heard the dreaded scrape. A pair of kayaks were scraping there way downstream and went right through the mergansers. Oh, well. I took 2 dragonfly shots and headed on downstream. I got on Rt.72 and then Rt.38 and turned up Clover Run Road, still hoping for some fungi. Nothing worth slowing down for. The dogs were getting restless. I pulled into there favorite squirrel and bunny chasing spot and let them explore. We walked awhile and I got tired of untangling Ralphie. I brought them back and tied them to the truck, so they could roll in the grass; which is one of their favorite sports. I sat there and scanned the area for something, anything to photograph while the dogs were entertaining themselves. Just a Red-spotted Purple was to be found, I guess it will have to do. The wind was picking up as I chased it around and I got some real bad photos. I noticed something was wrong with the pictures. I have a tendency to push some unintended buttons, when putting the new camera away. I haven't quite gotten used to it yet. The ISO somehow managed to get switched to 400 on this bright, sunny day. Not Good. I was sitting on the tailgate, watching the beagles roll and fake fight and noticed a little brown butterfly, perched on a poison ivy leaf. 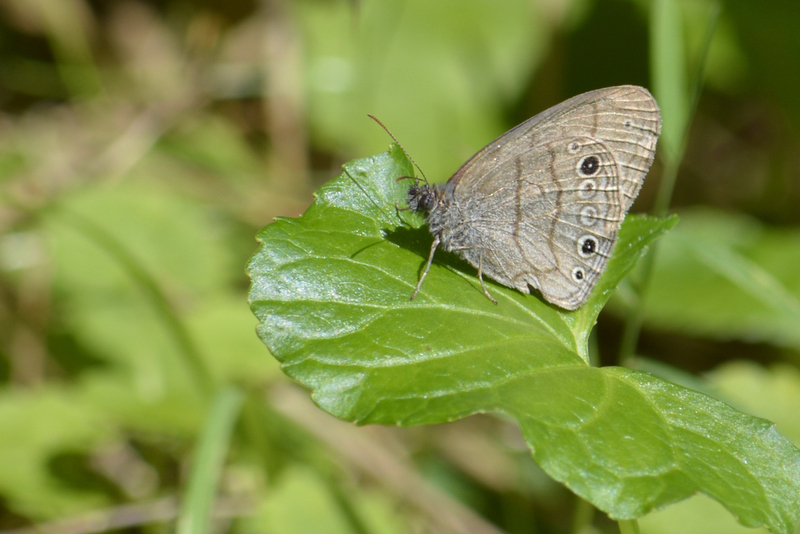 There were 4 or so of these little brown butterflies flitting around. Well, I don't have many photos of little brown butterflies and the camera was now set up properly. So, I was in pursuit and of course at this time, the wind decided to pick up. I managed to get one decent shot of the little brown butterfly and by that time the dogs were ready for some ice-water. So we headed on home. I looked the butterfly up when I downloaded to the computer and decided it was an Appalachian Brown (Satyrodes appalachia) that made sense and we have them in our area. Case closed, or so I thought. On Sunday, I was trying to identify some skipper photos (the birding community thinks sparrows are hard), try skippers. I found Butterflies and Moths of North America, a citizens science database for identification and sighting recordings (Really Nice). I submitted some skipper photos for a final answer as to what they were and I threw in the Appalachian Brown for their records. I received an e-mail shortly after identifying the skipper, along with a great notation that this photo wasn't an Appalachian Brown, but was a Carolina Satyr (Hermeuptychia sosybius), which until now has never been recorded and confirmed in the mountains of WV!! Well it has been, Now! What a great surprise. This butterfly has been found in the southern and western portions of WV. According to the species research I did, it has never been recorded and confirmed East of I-79. Like I have said before, you never know what you may find; if you just sit and stare. We are trained in our minds to associate butterflies and flowers. 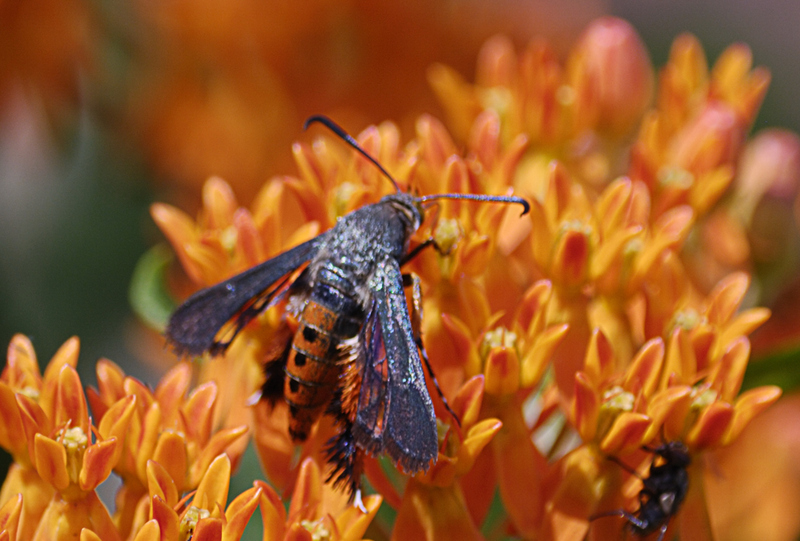 But did you know that there are some butterfly species that never use nectar as a food source? The Northern Pearly Eye (Enodia anthedon) is one such species. This butterfly is a species of wet woodland areas. The host plants for the larvae are members of the panic grass family. 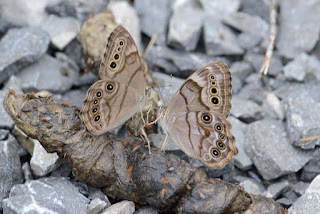 The Northern Pearly Eye feeds on carrion, dung, fermented fruit and tree sap. Judging from the fruit flies; this coyote turd seems to be a Northern Pearly Eye smorgasbord. This photo was taken on 8/4/12 at Pleasant Creek WMA in Barbour County, WV.